**$50,000 PRICE REDUCTION**LOWEST PRICED GOLF COURSE WINDSOR ON MARKET*** Handsome Refined Windsor Estate. 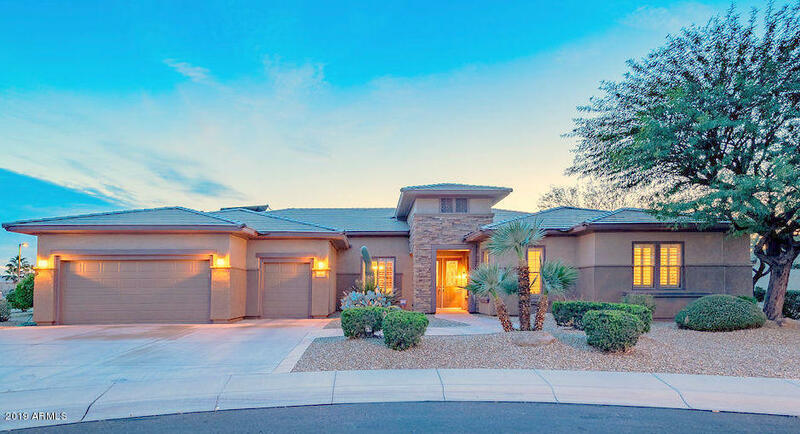 The Largest Model at Sun City Grand on Stunning Lot! Well Priced, under Competition. Soaring 12' Ceilings, 8' Interior Doors, Over $50,000 in Stonecreek Woodwork, Plantation Shutters T/O. Chef's Kitchen wt Slab Granite Countertops, High End Stainless Appliances, Gas Cooktop, Cherry Cabinets. Two Gas Fireplaces with Mantles and Granite Surrounds! Top Quality Built ins @ Living Room, Dining Room, Breakfast Room, Office, AZ Room, Third Bedroom. Crown Molding. Luxury Bath wt Jetted Tub, Huge Walk in Shower, Dual Sinks, His and Her Walk-In Closets. 2X6 Construction. Newer HVAC. Central Vac. Soft Water Loop. Solar Hot Water Heater. TV, Sound System, Electronics Remain in AZ Room.